It's time again for Tablescape Thursday with Susan of Between Naps on the Porch! This week's table is neither bold nor colorful. There are six place settings on a table that's literally scaled back (I removed the leaf). I was in a quietly reflective mood as I selected a vintage, soft, cream-colored Quaker Lace tablecloth. I was thinking of long-ago meals. 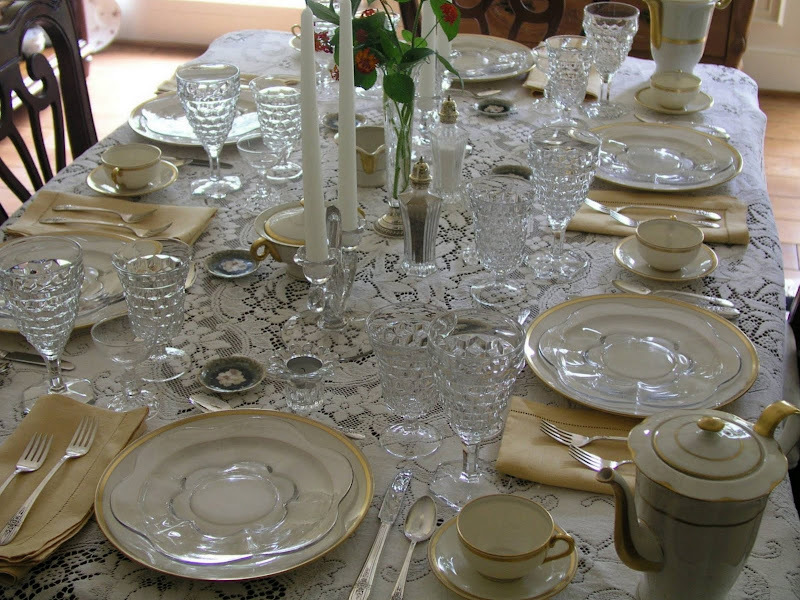 Of tables set by ladies using their "Sunday best" china, crystal, flatware, and linens. It's often said that the Golden Age of Hollywood began with "talkies" and continued through the early 1960s. During much the same era, something similar was happening with American glass, silver, and china companies. The best of them were creating beautiful, timeless products for American homes. There was a growing middle class of consumers clamoring for their products. Bridal registries became popular. What those brides so lovingly selected is often available today at estate sales, in antiques shops, and on eBay. Many of the designs have become classics -- as beautiful today as when they were first produced. The china is by Lenox. It's identified only as H2. The pattern was introduced in 1911. It looks very similar to patterns still in production today. The clear glass salad plates are Canterbury (1939-1955) by Duncan & Miller. The silverplated flatware is Triumph (1941) by International Silver. The napkins are vintage. The glassware is American (1915-1982) by Fostoria. Sometimes it's referred to as Early American. When I was a child, many of my mother's friends and relatives used American whenever they served company meals. I thought it was Fostoria's only pattern. Below is the "tall water" glass. I often re-purpose older glassware. Since most dinners today have only one wine served throughout, this is a good size to use as a wine glass. Below is the "low water" glass. I like it better then the "iced beverage," because it has a slightly longer stem and a graceful shape. The small glass below is a sort of cousin of American. It's called American Lady. It features the cubist-patterned foot and stem, with a smooth, blown-glass bowl. For those who prefer colorful glassware, Fostoria also produced the pattern with a purple (amethyst) bowl -- those are stunning! The ones I'm using were marketed as champagne glasses, but I'd use them to serve a nice liqueur with dessert. The Quaker Lace Company of Philadelphia was regarded for over a century as the producer of America’s most desirable lace goods. The success of Quaker Lace depended in part on their ability to meet their middle-class customers’ desires for both luxury and durability. In 1918 President Woodrow Wilson asked Lenox to produce the White House's china service in lieu of previously chosen French made patterns. He was trying to fulfill a Congressional mandate of 1826 stipulating that everything used in the White House should be domestically produced. Previous Presidents had been unable to find domestic china deemed suitable to serve honored guests at the White House table, and they remained dependent on foreign-made tableware. Woodrow Wilson broke this precedent by ordering a 1700-piece tableware set from Lenox at a cost of $16,000. Since that time, Lenox has produced tableware for Presidents Roosevelt, Truman, Reagan, Clinton, and Bush. I've combined several different china patterns today. The creamer and sugar bowl are Claridge by Theodore Haviland. The pair of two-light candleholders is Duncan & Miller's Canterbury. Many of the American products I'm showing you today were strongly influenced by European designs. To add extra interest and color contrast, I included the Bavarian butter pat plates just before I took the pictures. I've used them as iced tea spoon rests before. It's always a problem to know what to do with an iced beverage spoon after using it. Rules of etiquette say flatware can't ever touch the table/tablecloth after being used. I once saw iced tea spoons placed above the plate at a banquet in an elegant hotel. Is it "proper?" I don't know, but I like the look, and it saves space horizontally at each place setting. A closer view. I like the flowing, flame-shaped design of the candleholders. A late 1800's French Haviland teapot. It's marked "CFH" on the bottom -- for Charles Field Haviland. Charles was the nephew of David Haviland, founder of the Haviland china dynasty. Charles Haviland was in business in Limoges, France, from 1859 until 1881. The European influences are obvious throughout all the "made in USA" products I'm showing you today. As Martha Stewart says (speaking specifically of the British), "They've taught us so much about gracious living." I have Fostoria American salad plates but, to be honest, I think it looks more interesting to mix in a less "energetic" glassware pattern. Because of its popularity and long production run, there's a tremendous amount of American available. Most pieces (other than large serving pieces and rare items) are widely available at moderate prices. The coffee pot below is Theodore Haviland's Concorde, made in America. All Haviland china had been produced in Limoges, France, prior to 1936. Operations were moved back to Europe in 1958. Some trivia for you -- although the backstamp says "Theodore Haviland New York," Haviland was produced in America (using Haviland's porcelain formula, molds, decals, etc.) by Shenango Pottery of New Castle, Pennsylvania. The coffee pot below is also Theodore Haviland. The pattern is Gotham (1945-1958). I was pleasantly surprised to see how well it coordinates with the Lenox china. Claridge (New York) is very similar to Gotham. They're the same shape, but Gotham has a gold band vs. Claridge's gold line. I felt that a simple centerpiece (with a tiny footprint) would be all this compressed table for six required. I cut a handful of lantana, and used a vintage etched glass budvase. It has a weighted sterling silver base. Is this table old-fashioned? I think so. Traditional? Absolutely! Un-cool? Perhaps -- I sort of hope so! It's been a long time since I tried to be hip, or cool, or modern. That was when I was young and foolish -- and hadn't developed an appreciation of the timeless qualities of things cherished by previous generations. Candlelight and Fosteria's American pattern make agreeable dinner companions. I added a mayonnaise bowl and underplate after I'd already begun taking photographs. The little red spots in the bowl are fallen lantana petals. Does any of it remind you of a special person in your life or bring back memories from childhood? Thank you for joining me today. I hope you'll visit Susan and all her talented participants for the 101st Tablescape Thursday! Simply elegant! And I think the flowers are perfect...reminds me of those Sunday dinners when the hostess ran outside to cut a little bit of color to add to the table...very natural. I, too, remember seeing that Fostoria crystal pattern everywhere. My grandmother had it...along with a pattern whose stem was cut like a prism. (I loved that pattern...don't know the name.) Unfortunately, only one stem made it through the many moves...but I have it! It is a pleasure to visit your place and see your handiwork. You have mastered another outstanding tablescape and I think all that dine here would sense a welcoming table to sit at and have fellowship. My upbringing never had such luxuries at a table. I'd admire the china in the upscaled stores...I grew an appreciation for china and stemware as I became an adult. More comfortable around fine china and silver these days. Love it and am enjoying your post! Bill this is once again a beautiful table. I love the memories this brings. While my parents did not often entertain formally, they would occasionally set a formal table. My Mother's china was beautiful and I will set a table with it one of these day, it was Cream with a gold edge. I love the sweet and simple flowers, they seem perfect to me. Thank you once again for sharing such beauty and knowledge with us. It makes me yearn for more American made china. Grandmother has this Fostoria. Lots and lots of it. She and Grandad have collected it for years. They have subscribed to Antique Trader and traced down some very rare pieces worth a pretty penny. So, yes when Grandmother put out the good stuff at Christmas this was pretty similar to what the table looked like. I like how you put a different glass salad plates with it though. It looks nice to change it up a bit. Another lovely table Bill. So many beautiful dishes you have collected. As usual you create a gorgeous tablescape. All is so elegant and pretty! Another beautiful post Bill. I love the Quaker lace tablecloth, the vintage napkins and the Bavarian butter pats.A very elegant table full of memories for lots of people. Jackie in UK. I can picture the lady of the house setting this table with her Sunday best, the pride in her home evident with every loving touch. Thank you for this glimpse into an era I have never known. The table setting and the photographs are absolutely wonderful! I enjoyed the entire post. Thank you! A perfect table. There is nothing like gold rimmed china (another colllection of mine) and Quaker lace -- reminds me of Sunday dinner tables when I was a child and all of the "good" stuff was used. Alas, we've gotten away from that -- how sad! Your table is perfect as always -- and of course, I adore all ofyour things! I especially like the gold rimmed china. And it does successfully mix and match. Wow, Bill! I so look forward to your posts every week. I feel like they are my weekly lesson and I have so much catching up to do! Last week I bought for the first time, good china. When my husband and I got married, we didn't have the money to spend on this luxury, so I finally did it now, after 26 years of marriage. I chose Lenox Federal Platinum. It is a simple pattern with a platinum border . . . and I fell in love with the coffee pot that comes with the set. I hope to show it off in the near future. You are a true inspiration to me with your understanding of the classics. Thank you Bill for another beautiful table. It reminds me of dinner at grandma's many years ago. She had two sets of china, one for everyday and one for special days. I especially enjoyed the information about each piece. Thanks again! Bill, you set the prettiest table in town...this table is quite simple, but very elegant with all the sparkling crystal and candlelight. Thank you for sharing your vast knowledge; I really appreciate you giving a little history of the patterns. I love your table. I just persuaded a new bride to get wedding china for this simple pleasure you show. To continue a tradition and to preserve some semblance of formality. It's so beautiful when it all comes together. I love your tables, they are such the treat! Better than ice cream! Another work of art - so pretty and elegant! I remember when it seemed everyone wanted some Fostoria glasses.Hope you are having a great week and staying cool. Bill, you continually amaze me with your abundant resource of fine china, crystal, and silver. And then you add in the historical details of each. You definitely need to gather up your collection of photos and seek a publisher. With your knowledge and talent any book you published would be a hit! As for this table in all it's ellegance, the American Lady stems and the Haviland coffee pots are stand outs for me. Bill, your table is un-cooly cool. You have such beautiful things, I wish that I was your child so that everything would be in your will to me. :) And yes, your table does remind me of my mother - she had that tablecloth and little champagne glasses like that; and my Aunt Helen - she had the Lenox gold and white dishes. She gave most of everything to her daughter-in-law but, years ago, she gave me a covered butter dish, and a small covered serving dish from the set. I should do a post myself with those pieces... Anyway, lovely, as usual, Bill!! Elegant and beautiful tablesetting.I like traditional. Beautiful table setting as usual. Reminds me of the ones my Grandmother would do with your extra touch of elegance. Not only are all your tablescapes exquisite, but every piece of china,crystal, and silver is impeccably presented.There is never a smudge or stain on any of your beautiful pieces. Your attention to detail is marvelous. Ahhh that is so lovely, and yes, it makes me so thankful that my Mom was a "table" person who taught me well! That has been passed along to my daughter who sets a beautiful table as well. The other beauty in your post is that my Mom's glassware was Canterbury and my daughters is American. You just made a big hit in my family!! Thank you so much for posting! Yes, the tablecloth reminds me of my mom's. I have to do a scape one day with it, but then it would pale to yours! I think I smell the roasted chicken my grandmother would make for Sunday dinner. I don't remember all the details of her table settings, but my brother and I have most of the pieces. She was first in her family to be born in the United States as her father left Russia because the promise to the German immigrants was broken when he had to enlist in the Czar's army. I can only imagine what life was like way back then. Very elegant. Anyone would feel very special seated at your table. Beautiful as always, Bill. I'm always glad to see people appreciate the glass and china their families cherished. I love all your 'scapes, but this one seems more simple somehow and elegant in that simplicity. I just like it a lot. Maybe because it reminds me of the past. Thanks so much for sharing beauty with us each week! Bill, why strive for hip or cool, when tasteful and elegant is SO MUCH BETTER! Another beautiful table and lesson for the rest of us. I agree wholeheartedly with Sarah. It is time for you to seek a publisher. I would definitely buy! So pretty. I love your glass and gold and the mixtures of china. Lovely as always. When I did my tablescape in honor of my dad I was trying to think of the name of the lace tablecloth, it was Quaker lace. Thanks for helping me remember. This is just lovely and elegant and reminds me of home. Bill...What a lovely table! That's the perfect word for an understated but beautiful table. I'll take traditional any day!!! As always, very elegant, Bill! oooohhhh sparkly table. How crystal clear the glasses are. So many facets. Gorgeous as always! Love the look of the pics with the stemware sparkling! You truly do make me appreciate the "heritage" and beauty in dishes from bygone eras! What an informative post, and such an elegant table! I love how the colors of the beautiful linens complement the china! ♥ the hemstitched vintage napkins! I can do that stitch on my sewing machine. I should get busy & embellish some of my plain white ones. The Bavarian butter pat plates are pure delight...just that little touch of color to an otherwise monochromatic scene. This is an elegant table & any guest would feel honored & humbled to be invited to such a beautiful dinner setting. Wonderful treasures, Bill...thanks for telling us all about them. So pretty! I love all of the glassware, and I've been looking for similar candle holders-enjoy! Just beautiful. My mother set this table for company. Takes me back. Another gorgeous table, my friend. Seeing you use Fostoria makes me smile. That was my mother's choice for glassware, and though she gave much of it away I did manage to lay claim to water glasses and enjoy using them, maybe because they were hers. How you photograph your tables is superb. AS always, this is gorgeous. Thank you for sharing the chandelier, too! Elegant, beautiful and timeless. The hallmarks of a classic. Love the trivia on Haviland. I wasn't aware that any of it had actually been produced stateside, but I am familiar with the markings. Thanks so much for the info. Bill, this is such a lovely table. I enjoy reading about the history of these pieces. Lenox manages to be so classic - pieces from the past and modern ones as well. I've been asking my mother questions about her mother's china. She has no memory of it being used. It was just kept in the china cabinet. That just seems sad to me. I think the simplicity of the lantana is perfect. I know we are both struggling to find things in the garden to use. I hadn't thought about cutting my lantana. I look forward to your tables every week. This is Blake with Mikasa and we noticed your great use of our salt and pepper shakers in this design. This table is so lovely! Thanks for letting Mikasa be a part of it! Thank you for sharing your elegant table! I love the butter pats, linens and teapot they are so beautiful! I look forward to your tablescapes every week. Thank you! This is Sunday Dinner in the Deep South. You have inspired me to do it this very week, and I can already smell the fried chicken and biscuits! I treasure my mother's American, etc. A beautiful table. Thank you for taking the time to share all of the information about the pieces you used. So lovely. You've done it again! The simplicity of this china is perfect. The creamy butter yellow linens are so softly pretty. Like everyone, your knowledge of everything you use is the highlight of your tablescapes. I do look forward to knowing why so many pretty things catch the eye. But I have to admit, I love it when there's a story to follow. When time is short as it has been this summer...I do so enjoy taking time to enjoy your tablescapes. Always so special. Thanks for sharing another lovely table setting and for the historical notes. My Quaker lace tablecloth was the first formal tablecloth I bought back in late 70's. I still have it, though I have a much bigger dining table now. I very much enjoy each of my Lenox china sets - Autumn and Holiday. PS I wanted to let you know how much your last couple of comments have meant to me on my blog. Your words were SO encouraging and I want to let you know I truly appreciate you. This is elegant, stylish and just plain gorgeous! I love this! You know what Bill? One word comes to mind to describe you tablescape: Classic! It does remind me of the table my grandmother used to set. Back when I got married, everyone had the Lenox with gold trim. It was what you registered for. I really appreciate the serene and calm of your classic table. And of course, those Fostoria glasses are my all time favorite! Your table is so elegant, It does remind me of our family gatherings growing up in upstate NY. I no am the happy caretaker of many of my grandparents and great grandparents treasures that I love to use. btw, I think you flowers are just lovely! Classic elegance ......... everything you have shared! Hello Bill! I feel so bad not visiting more often, but boy oh boy, each visit is a definite treat! I love love those pieces! LOL You've got me looking at ferns more after seeing your outdoor tablescape. See you at the next TT! You are totally right about how we learn to appreciate the beauty of the classic and timeless...I was hip too, but in the past 20 yrs. or so, I'm so terribly classic and elegant, I love to use good china, tablecloths with it's napkins, nice fresh flower center pieces, etc.....I like to entertaine for dinner, I have 2 tables I set the best I can. Thank you for the beautiful pics aand details...I will do this next time.